The AGNITY Communication Application Server (CAS) is a virtualized service delivery platform specifically designed for Service Providers to meet their high capacity and throughput needs. The platform architecture is modular, layered and extensible. This makes it easy to extend the platform with additional connectors to bring in new network/data connectivity as needed for additional applications (e.g. HL-7 feed for Healthcare vertical). On the “north” side of the CAS platform AGNITY supports applications – created from reusable Application Components, built by either AGNITY, the operator, or a third party utilizing its App Creation or Development tools, client SDK’s (iOS, Android and WebRTC) and Open API’s. The platform supports sophisticated application chaining and a Service Oriented Architecture (SOA) ESB framework to allow individual calls to invoke application logic from multiple applications and resources – either on CAS platform itself or external. Multi-Protocol Handling is a key function of the CAS platform. On the “southbound” side, the platform supports interfaces to all legacy networks (fixed and wireless) and all IP networks (SIP and IMS). This enables a single application on the CAS platform to support subscribers from legacy networks and next generation networks. This also enables a call initiated in one network, say IN/SS7, to access resources in other network, e.g. media servers in IP network. In addition, calls can be handed-off from IN/SS7 network to SIP/IMS network after initial processing to save on SS7 network resources. This completes the separation of the underlying network from the application. Now, as networks evolve, subscriber access to applications is no longer a gating item that has to be addressed before subscriber migration can occur. 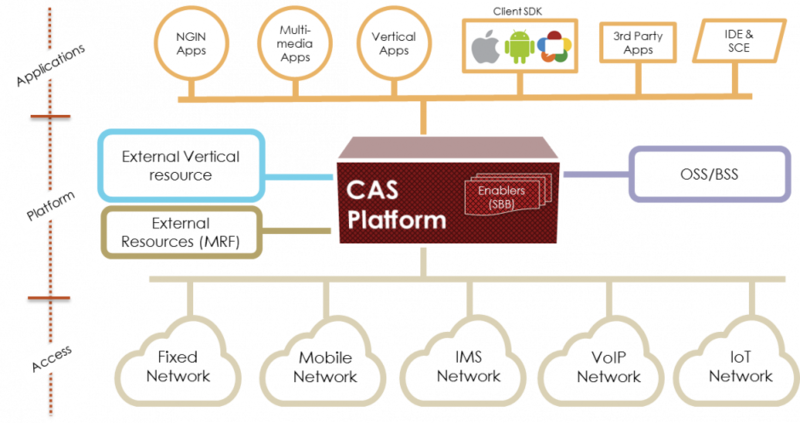 The CAS platform’s extensibility goes beyond network components. The CAS platform also connects with external resources – be they media resources for Multimedia IVR or Multimedia conferencing or “horizontal” resources such as LDAP directories or CRM tools for enterprise applications or “vertical” resources such as EMR (electronic medical records) database for the healthcare vertical. This capability adds tremendous flexibility and creativity to application development. The platform is packaged with its own Element Management System (EMS), Subscriber Management and Provisioning System (SMS) and Report Server (RS). These components can be used “off the shelf” or the functions can be integrated, via restful interfaces and open APIs, to existing Service Provider OSS and BSS systems. AGNITY provides a number of key Application Components on the CAS platform that can be assembled into customizable application logic for quick service delivery. The platform offers Open APIs and SDKs to facilitate integration with CSPs backend systems as well as easy integration with modules within enterprise domains e.g. LDAP Directory, etc. Single platform/ Multi Tenancy: Supports multiple applications on a single platform with the ability to partition applications and application management independently to multiple enterprise customers. Reliability: Consistent applications across network types, and field-proven reliability in networks worldwide. Extensible Connector Framework: Add new application capabilities by incorporating new network interfaces and access to new external resources. Truly Converged Applications: One business application logic for all networks, including legacy TDM (3G, SS7/INAP), IMS, VoIP/Internet (SIP, HTTP, Websocket) – truly access agnostic..
AGNITY CAS platform has library of app components which can be used to create new and innovative applications. Any combination of app components can be used in creating new or customizing the existing application. There are mainly 5 categories of app components as listed in the diagram below namely – Basic call control, enhanced code, aggregation, collaboration and integration App components. Depending upon the business logic requirement, appropriate app component can be used to quickly build and customize the applications. AGNITY, using a blend of these different app components, has created a new breed of highly customizable Enhanced Applications that inject enterprise-specific ‘context’ into the communication channel and provide a whole different communication experience and enormous value. AGNITY MMC is a network-based multimedia conferencing module, designed for mobile/LTE service providers, to deliver a bridge-based Audio, HD Video conferencing service along with additional screen-sharing, white-boarding and messaging features. The application has been developed as a SIP based application using SIP for call signaling, RTP for Media, and MSML (RFC5707) for controlling the media server, perfectly suitable for the service providers to offer this as an In-network solution. Web APIs are also available for easy integration with external third party systems. Standard SIP clients for the application are supported on Smart Phones and Desktop Web phones. It offers easy-to-use functions such as one-click joining the conference bridge from mobile phone while on the road, integrated with phone’s native address-book so one can dial-out easily and request another participant to join the conference immediately. Functions such as setting up an ad-hoc/meet-now conference, scheduling/re-scheduling a future one-time or recurring conferences and monitoring an on-going conference (e.g. mute/un-mute, add/drop a participant, etc.) are supported from the web portal. The standard bandwidth management (TMMBR) is supported so consistent and quality video is delivered to all conference participants. With AGNITY CAS platform our partners can expand their services further for new verticals by addressing their common communication challenges. What we offer to enterprises is one app which combines secured audio, text and video with location, presence, access to external data-bases, IoT Devices and more – Contextual Communication. AGNITY will work alongside as a technology partner to enable our partners to monetize their network investment by integrating vertical applications, an untapped area of additional revenue channel. 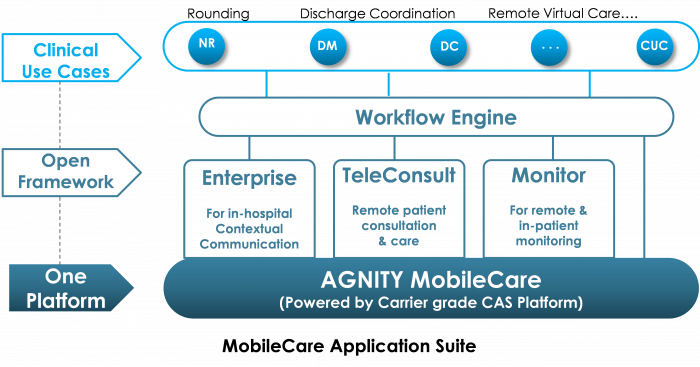 AGNITY has developed its MobileCare Application suite for contextual communications among clinicians, monitoring and alerting the patient’s vitals and facilitating remote teleconsultation sessions between patient and physicians in Healthcare vertical. AGNITY MobileCare is designed to replace primitive communication over outdated or non-integrated paging, cell phone and answering services. AGNITY MobileCare solution delivers a secure, future-proof, contextual clinical communication platform that is HIPAA compliant. MobileCare solves the communication challenges across the full continuum-of-care for patients. It uses secure text, voice, and video to provide rich clinical context for communications and enhances usage of the existing IT investments, such as EHR, nurse call systems, and telemetry etc. Specific workflow benefits include specialist consults, improved efficiency in care transitions, including patient transfers between ED, ICU, Medical/Surgery and patient discharge.